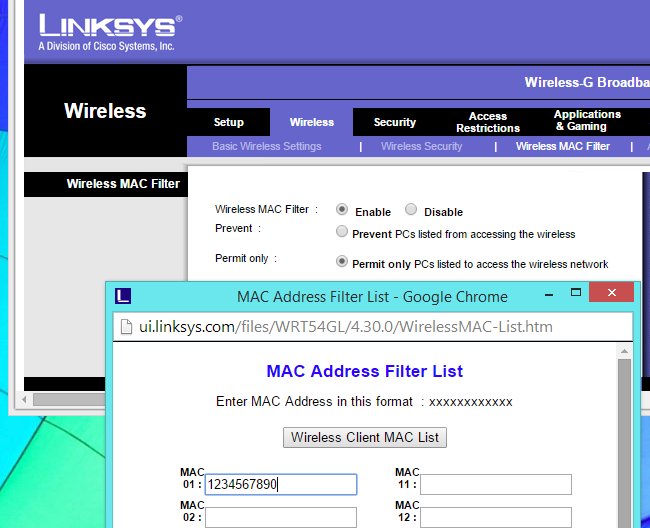 MAC address filtering allows you to define a list of devices and only allow those devices on your Wi-Fi network. That’s the theory, anyway. In practice, this protection is tedious to set up and easy to breach. This is one of the Wi-Fi router features that will give you a false sense of security. Just using WPA2 encryption is enough. Some people like using MAC address filtering, but it’s not a security feature. Each device you own comes with a unique media access control address (MAC address) that identifies it on a network. Normally, a router allows any device to connect — as long as it knows the appropriate passphrase. With MAC address filtering a router will first compare a device’s MAC address against an approved list of MAC addresses and only allow a device onto the Wi-Fi network if its MAC address has been specifically approved. Your router probably allows you to configure a list of allowed MAC addresses in its web interface, allowing you to choose which devices can connect to your network. So far, this sounds pretty good. But MAC addresses can be easily spoofed in many operating systems, so any device could pretend to have one of those allowed, unique MAC addresses. MAC addresses are easy to get, too. They’re sent over the air with each packet going to and from the device, as the MAC address is used to ensure each packet gets to the right device. All an attacker has to do is monitor the Wi-Fi traffic for a second or two, examine a packet to find the MAC address of an allowed device, change their device’s MAC address to that allowed MAC address, and connect in that device’s place. You may be thinking that this will not be possible because the device is already connected, but a “deauth” or “deassoc” attack that forcibly disconnects a device from a Wi-Fi network will allow an attacker to reconnect in its place. We’re not exagerating here. An attacker with a toolset like Kali Linux can use Wireshark to eavesdrop on a packet, run a quick command to change their MAC address, use aireplay-ng to send deassociation packets to that client, and then connect in its place. This entire process could easily take less than 30 seconds. And that’s just the manual method that involves doing each step by hand — never mind the automated tools or shell scripts that can make this faster. At this point, you may be thinking that MAC address filtering isn’t foolproof, but offers some additional protection over just using encryption. That’s sort of true, but not really. Basically, as long as you have a strong passphrase with WPA2 encryption, that encryption will be the hardest thing to crack. If an attacker can crack your WPA2 encryption, it will be trivial for them to trick the MAC address filtering. If an attacker would be stumped by the MAC address filtering, they definitely won’t be able to break your encryption in the first place. Think of it like adding a bicycle lock to a bank vault door. Any bank robbers that can get through that bank vault door will have no trouble cutting a bike lock. You’ve added no real additional security, but every time a bank employee needs to access the vault, they have to spend time dealing with the bike lock. The time spent managing this is the main reason you shouldn’t bother. When you set up MAC address filtering in the first place, you’ll need to get the MAC address from every device in your household and allow it in your router’s web interface. This will take some time if you have a lot of Wi-Fi-enabled devices, as most people do. Whenever you get a new device — or a guest comes over and needs to use your Wi-Fi on their devices — you’ll have to go into your router’s web interface and add the new MAC addresses. This is on top of the usual setup process where you have to plug in the Wi-Fi passphrase into each device. This just adds additional work to your life. That effort should pay off with better security, but the miniscule-to-nonexistent boost in security you get makes this not worth your time. MAC address filtering, properly used, is more of a network administration feature than a security feature. It won’t protect you against outsiders trying to actively crack your encryption and get onto your network. However, it will allow you to choose which devices are allowed online. For example, if you have kids, you could use MAC address filtering to disallow their laptop or smartphpone from accessing the Wi-FI network if you need to ground them and take away Internet access. The kids could get around these parental controls with some simple tools, but they don’t know that. 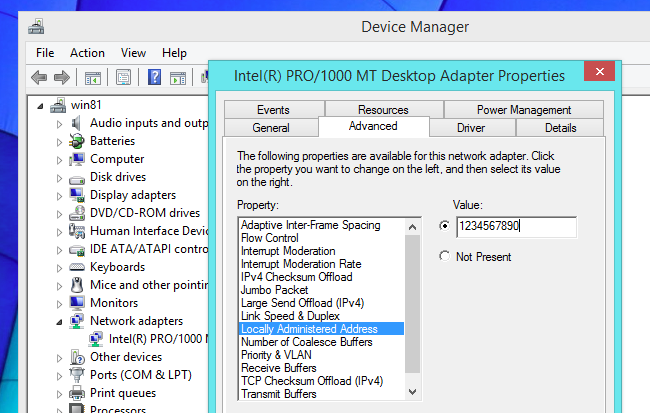 That’s why many routers also have other features that depend on a device’s MAC address. For example, they might allow you to enable web filtering on specific MAC addresses. Or, you can prevent devices with specific MAC addresses from accessing the web during school hours. These aren’t really security features, as they’re not designed to stop an attacker who knows what they’re doing. If you really want to use MAC address filtering to define a list of devices and their MAC addresses and administer the list of devices that are allowed on your network, feel free. Some people actually enjoy this sort of management on some level. But MAC address filtering provides no real boost to your Wi-Fi security, so you shouldn’t feel compelled to use it. Most people shouldn’t bother with MAC address filtering, and — if they do — should know it’s not really a security feature.